But I digress. I have been having a hard time for several months, although I've been trying to distract myself. I think it has a lot to do with the fact that my Papa's birthday was on July 4th. The last time I visited him was on his 97th birthday, last summer. He was very frail, but delighted when I surprised him with my first ever miniature project, a room box I made for him as a birthday present. I knew deep down is was the last time I would ever see him. For ten years I had been preparing myself that any time I saw him could be the last. I was thrilled that he came to my wedding in 2004. I know my sister was delighted when he was able to attend hers a couple of years ago. For years he seemed to defy the odds. He remarried in his late 80s. He and his second wife travelled the world, volunteered, welcomed great grandchildren, honestly, I had a hard time keeping up with the two of them. I loved watching them together. The last time I saw my Grandpa, he put on a good face for his wife Ruth and his children, joking that he had to live to 100 so that he could get a letter from the queen, but I could tell he knew he didn't have much time left. When we were alone he spoke of how lucky he was, that he had been blessed with a good life. He told me I shouldn't be sad, that death is a natural part of life. He said he wasn't scared to die, he knew he was going to heaven, and he was looking forward to seeing Nana, who passed away when I was 13, and Trevor, his nephew who passed away at a young age from leukemia. One of the things that remains with me about the week I spent with him is how celebratory the mood was. While I was there I looked through a photo album that had been put together of his 90th birthday. It was a huge album, that had been held at their local church hall. He had worn a green bow tie (in honor of his Irish heritage) and given a speech. Many others has spoken, telling funny stories and taking about his integrity, sense of honor and contributions to the community. I love the last picture in that photo album. It's a picture of him with a dustpan and broom, cleaning up at the end of the broom. It sums up his character and personality. He didn't believe getting old earned him the right to sitting down or a break from clean up duty. Since turning 97, he wasn't comfortable in large groups. But that didn't mean no celebrations were planned! We would have 4 dinners to accomodate my Dad's family, who had travelled to Edmonton for the occasion, my Granpa's niece and her daughter, and my stepgrandma's two sons and their wives. It was the most fun I had in ages. Stories were told. Jokes were told, and they became more and more inappropriate as the evening wore on. On one evening I laughed until my sides hurt as my step grandma's Ruth's son told story after story about how they travelled as a family to Europe in the sixties. Back then it was not commonplace for families to sight see in Europe. Billy, the youngest, was bored and caused all sorts of trouble to stir up a bit of excitement. One day they he was sitting parked in their rented van outside the Vatican and he thought it would be fun to release the Emergency brake while the rest of the family (I think there were at least 7 of them all together) and the van happened to be on a hill. His embarrassed parents hustled the rest of the children into the van while a disapproving priest looked on. Another day they were in a theme park and met another family they knew. There was a big gang of adults and kids and he got lost in the fray. Apparently he wandered around lost by himself for several hours, fairly unconcerned. And his parents, too, didn't panic. Maybe they would relieved at getting a break from their, um, feisty son! I wasn't able to go to my Papa's funeral when he passed away peacefully in a hospice on December 10th, and I think that's just as well. I'd rather remember him the way I left him last June. Laughing, joyful, at peace, and reminding me that death is a part of the great adventure we are all on. When I go to Calgary at the end of July to visit my parents I will pick up the roombox I gave my Grandpa. I've decided I will add to it, bit by bit. A picture of the two of us, shrunk down and mounted on the wall. He wrote his memoirs and had them bound. I'll shrink down that and include it. I'll build a simple bookcase and fill it with miniature copies of his favorite books. Perhaps I'll put together a miniature family photo album. I'll add more as the spirit moves me. This morning was the first time I acknowledged to my husband that I'm doing a lot of grieving for my Papa this month, I spoke of how much having him in my life has given me a sense of love of belonging and my belief that once this gift of love is given it cannot be taken away, even after a loved one dies. I became choked up and cried a bit, but they were healing tears. I have always thought that we grief in stages. I started grieving when I first planned to visit him last summer, and I am still grieving. I think I will never stop grieving, but I think as time goes on, that grieving can take on a sense that is mostly full of love and joy, with only a tinge of sadness. I think I have quoted this poem before on here, but it's my favorite, and I have new followers, and it's my blog so I can do what I want to ha ha. So sorry to hear about your Grandpa. It sounds like he was an interesting and inspiration character. My boyfriends Grandfather passed a few years ago and he was also born on the 4th of July. We always try to visit his memorial near his birthday. It's wonderful that the room box will be returned to you and that you can add to it as a lovely memory of him. Oh, Thanks Indy! I think everybody thinks there own Grandpa is the best, but my Papa, well he had many adopted grandkids :) He used to tutor a bevy of shy young immigrant asian girls from church, and they simply adored him. It was quite sweet. They brought him food and doted on him. If you enter Grandpa in the search box all the posts I wrote about him should come up, including pics of the box, our visit, the post I wrote when I got news he died, and his obit, which my Dad wrote, which really shows what an amazing life he lived. So many people reminded me how lucky I was who have him in my life for so long. I really took that for granted until I lost him! I'm glad you and your family have a ritual where you remember your Grandfather. This morning I convinced my husband that we will honor my Papa by naming a son after him ( middle name). I'm convinced our first born will be a son, and then we'll have two daughters. I'm prepared to be wrong, but I've been known to be right about such things on occasion! My condolences for the passing of your grandfather. You seem to have loved him very much. 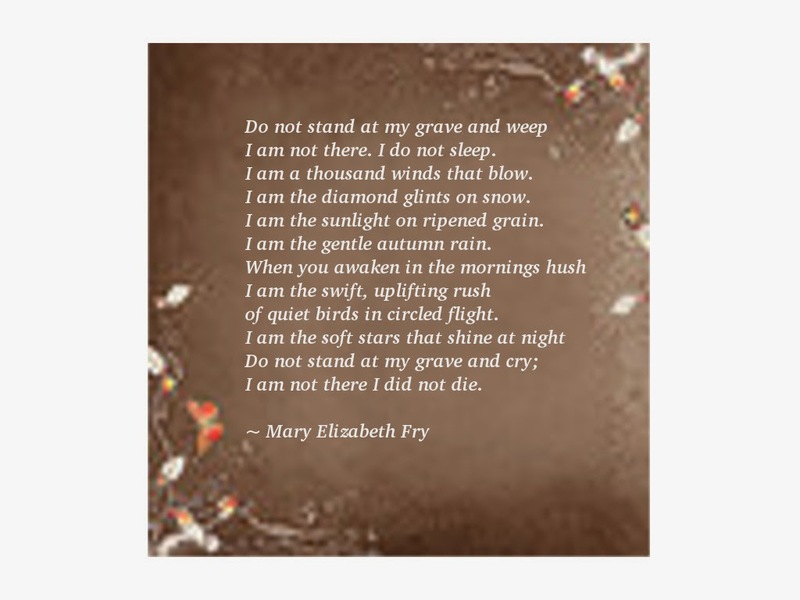 That is a lovely poem and it must bring you consolation whenever you read it. Personally, I prefer to think of my loved departed ones as being with the Lord. This is what brings me solace. You must try to overcome your sadness. Your grandfather would not have wanted you to be so torn. As he said, dying is part of the life cycle. He had a long wonderful life from what I read. And in the end, he was ill and could do nothing. Be happy for him that he is now at peace and no longer in pain. You have your beautiful memories. Hang on to those and once in a while, think of them. Let them comfort you. Take care! Hi Ruth! I remember when you first posted about your 'Papa's' passing and I recall how stricken you sounded from your blog. I know that grieving fluctuates and sometimes your emotions are sitting right on the razor's edge and at other times they are softened around the edges. I think that as I read this tribute to your Grandpa. that the edges are soften right now. They may become intense once again as you reclaim the roombox that you made especially for him but you sound much more quiet inside. Life is designed for our pleasure and pain. In our pain and times of grief we can recall what joy someone brought to our lives and how we were able to do the same for them,too. Your grandpa sounds like he was a great man with a great big heart, and so do you! Distance between two provinces and now the distance between heaven and earth does not change or diminish your love for him and one day you can and will see each other once again just as your Papa anticipated seeing your Nana again. The Lord has promised that and since God is a Gentleman and always keeps His word, you can believe it. I do! P.S. In reading the comment and reply to Indy-Poppy..... Are you expecting? Grieving has no time line or limit, it takes its course, we ride its ups and downs and then we learn from our experience with it and grow. The two of you would have liked each other. He had the same lust for knowledge and skill with his hands that you do. you wrote beautiful words...very moving! It is a great fortune in life to have had people to love and to be loved back! I am sure that he will be smiling down to youJust as in the beautiful poem! I completely agree with you about my life being rich in love. I always knew, as a young child, that I was unconditionally loved by my parents and grandparents. I think as long as you can convey that to your child, any other mistakes you make can be forgiven. My Mom Used to sing to me: "You are my sunshine, My only Sunshine, You Make me Happy When Skies Are Grey. You'll never Know Dear, How Much I Love You. So Please Don't Take My Sunshine Away." This was so beautifully written, Ruth. It sounds like you have a huge treasure trove of wonderful memories of your grandfather. Ruth, you know I have tear streaming down my face because I know how you feel. It not that you are grieving a lot it just that the memories are so STRONG. I really do miss my father who passed away in 1999 and he lives through my blog. Every time I sit and play and create stories for my blog. I have to have Mr. Dotson spirit in there. It is quite wonderful that we were both blessed to have these great mean who have shaped our lives. Hey, I wouldn't mind a letter from the Queen myself! I wrote you an email reply Brini, since I was able to publish your post last night via my tablet but not reply to it on the blog. I couldn't get on my laptop because I couldn't get internet connection on this laptop. I finally figured out it was all my fault!! It's because I installed an extention that allows me to watch shows on Hulu for free (usually a no no for anyone outside the US) Bad Ruthie! Sigh. I so enjoyed those two episodes of Desperate Housewives I watched last Friday. Oh well. I started following your blog and commented on your last post. Love your blog girl! I've secretly lusted after the Liebster award for months <3. I feel very touched and honored Audra. Grandpa's are wonderful people aren't they? Any of us who have been lucky enough to have had one who was a happy, involved part of our childhood is incredibly lucky. Hi Ruth I remember you tellig me about your Grandpa and how it made me feel about my Grandmother who passed away, she was the only one who loved me I can feel your loss... I never thought about making a roombox for her but I am now thanks to you ..that poem just broke my Heart. Yes, we can skype while I clean. I'll call you in a sec.